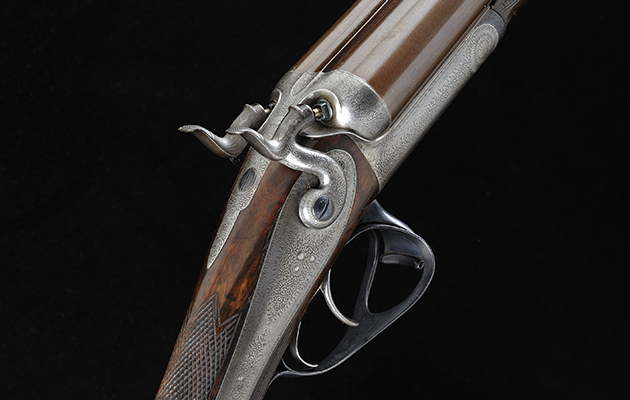 A rare sporting gun built for the Prince Regent by Ezekiel Baker is estimated at £10,000-15,000. There will be a clutch of royal guns for sale at Sotheby’s this December. Gavin Gardiner Ltd’s sale of Modern & Vintage Sporting Guns & Rifles will include rare guns made for royalty and nobility, including a gun belonging to His Royal Highness the Prince of Wales, the Prince Regent. The sale will take place at Sotheby’s New Bond Street, London W1A 2AA on Tuesday 1 December. 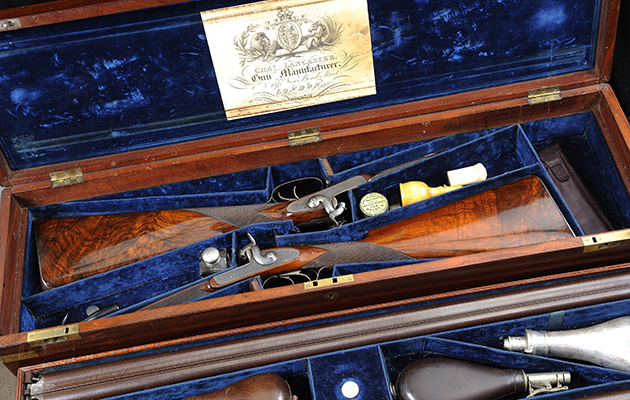 The auction will see over 300 lots of vintage sporting guns, rifles and shooting accessories. The gun is inlaid with gold Prince of Wales feathers. 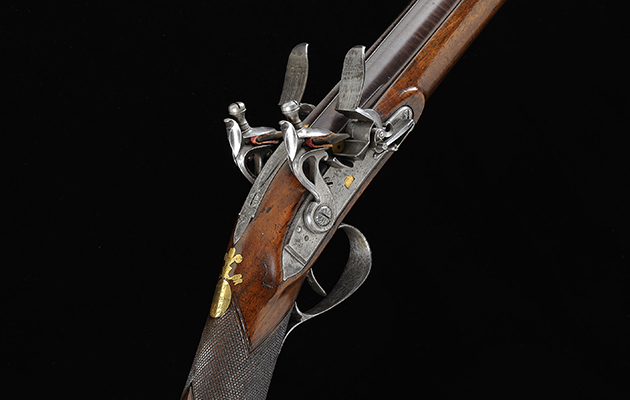 The royal guns for sale include a rare 15-Bore double ignition flintlock sporting gun by Ezekiel Baker from the John Bunney Collection. It was built for His Royal Highness the Prince of Wales, the Prince Regent and is estimated at £10,000-15,000. Engraved “Gunmaker to His Royal Highness the Prince of Wales” and inlaid with gold Prince of Wales feathers, it has a presentation inscription of “Gift to My Friend Bob”. The Prince Regent was the eldest son of George III and Queen Charlotte. He was made Prince Regent in 1811 due to his father’s insanity, and was crowned George IV on January 29, 1820. At the end of the 18th century, the Prince Regent took great interest in Ezekiel Baker’s work. One of the leading London gunmakers, Baker’s infantry rifle was adopted by the British Army in 1800. He sold many guns to the Prince and it is thought that he spent a great deal of time shooting with him. The pair of guns were built for Prince Albert as a gift from Queen Victoria. Other royal guns for sale include a pair of Charles Lancaster 14-bore percussion guns, which were built for Prince Albert as a gift from Queen Victoria. They are estimated at £30,000-35,000. The ribs are signed “Charles Lancaster, 151 New Bond Street, London”, the trigger guards are engraved with dogs and game and the gold escutcheons are engraved with a crowed ‘A’.  They come in their maker’s velvet-lined mahogany case with lift-out tray, tools and accesories. Prince Albert was a regular customer of Charles Lancaster, and the company received the Royal Warrant in 1843 after he ordered his first pair of 15-bore guns. This gun was built for the first Duke of Cambridge. 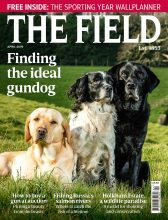 The auction also includes a Joseph Manton 20-bore percussion gun converted by Tanner and built for the first Duke of Cambridge, Adolphus. It is expected to fetch between £4,000-6,000. It is signed on the rib “Joseph Manton’s New Improvements by His Majesty’s Patent” and the silver escutcheon is engraved with his crest, a crowned lion. Prince Adolphus was the tenth child and seventh son of King George III. He is the great great grandfather of Her Majesty Queen Elizabeth II. Find out more about the sale from Gavin Gardener.